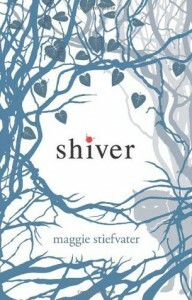 One thing that surprised me about Shiver was that I really liked the protagonist, Grace. She’s a beautiful blonde, oblivious to her own good looks – but she’s also clearly, visibly smart, and not just because she talks about reading books. She knows Sam’s a werewolf about three chapters in, she works out what happened to a recently changed ‘victim’ on her own, she even works out a few of Sam’s secrets before he gathers up the guts to tell her. After reading so many YA romances with female leads that leave me wanting to scream at the stupid girls, this was a refreshing change – and the surprises didn’t stop there.There’s no drawn-out waiting for Sam to ‘reveal’ his supernatural secret – she works it out, the story moves on. After so many books with drawn-out “Say what you are.” “Vampire”-style reveals, slow-to-happen first kisses that shake the heavens, and heavy hints to mysteries that main characters can’t work out, it all feels very fresh. 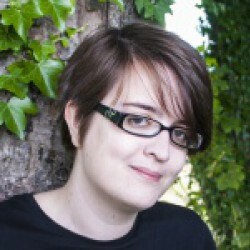 I don’t have any problem with these tropes (I like working out the mysteries, and slow lead-ups to first kisses can be done well) but it’s nice to have something different.I also love the way Stiefvater does chapters – they’re scenes, as long or short as they need to be, swapping between characters with a temperature reading to hint at the ever-so-important outside temperature during the chapters. The short scenes add a lot to the pacing, and they help the story to zip-along even in the mundane day-to-day moments.There are a few slower moments in this book – family drama, school drama, day-to-day life. It gives the book a nice touch of reality, but it can slow down the pacing a bit. About half-way through the story I got a little tired of the constant romantic drama and wanted some action – this is a werewolf story, damn it, give me epic wolf fight scenes or even just ominous confrontations.In the end, the slower pacing was all that stopped me making that jump from enjoying this book to loving it. I really wanted more action, but this series’ is focused on the romance first, then the characters, and the action last of all. I went into it with the wrong expectations, but if it’s a paranormal romance you’re after, this book will tick all of your boxes.